Cool summer top from 1935, knitted in bouclé cotton/linen mix, using an eyelet lace pattern for the body, and ribbing for the yoke. I have adapted the yoke slightly, and given a better fit to the sleeves. "This engaging affair uses a fairly thick wool (quickly knitted!)". Here I demonstrate its versatility - it could be worn as a smart top with a skirt - or in the garden with denim shorts! 2nd Round: Knit if right side facing; purl if wrong side facing. The back and front are knitted together in the round. Using a No 11 (3mm) circular needle, cast on 198 stitches. Place stitch markers to mark the beginning of the round and at the half way mark (99 sts). Work 4 inches in k2, p2 rib. Cast off the first 8 sts of the round, then, with one stitch on the right hand needle, commence the pattern row, and work 9 pattern repeats; k1. Cast off the next 16 sts; then, with one stitch on the right hand needle, commence the pattern row, and work 9 pattern repeats; k1. You should have 83 sts to work for the back and front. Turn the work and purl back across 83sts. Continue working back and forth across these 83 sts in pattern as set, starting and ending each row, with one plain knitted stitch. Work 2 inches (about 6 more eyelet rows), ending with a purl row. Next Row: k1, * k2tog, k2, wool forward, k1, wool forward, k2, k2tog * ; put the next 63 stitches on to a spare needle; join in a second ball of wool, repeat from * to * once, k1. Continue on the latter 10 stitches till work measures 19½ inches from commencement. Cast off 9 stitches from armhole end. Finish off the opposite shoulder to match. Rejoin the yarn to other set of 83sts, with wrong side facing, and purl back across 83sts. Complete the front exactly as you did the back. Join the shoulders either by stitching or grafting. 28sts down the side of the neck, from the shoulder seam, 63 across the front (from the spare needle), 55 up the right side of the neck, 63 across the back of the neck (from the spare needle), 27 up the side of the neck. If you are using double pointed needles, divide the stitches as follows: 79 on the first and third, and 78 on the second, or if you are using a circular needle, place a stitch marker at the beginning of the round. 1st Round: k2, (p2, k2) six times; p2tog; p1, (k2, p2) fourteen times; k2, p2tog, p1, (k2, p2) thirteen times, k2, p2tog, p1, (k2, p2); fourteen times, k2, p2tog, p1, (k2, p2) seven times. 2nd Round: k2, (p2, k2) six times, p2tog, (k2, p2) fourteen times, k2, p2tog, (k2, p2) thirteen times, k2, p2tog, (k2, p2) fourteen times, k2, p2tog, (k2, p2) seven times. 3rd Round: k2, (p2, k2) six times, k2tog, k1, p2, (k2, p2) thirteen times; k1, k2tog, k2, (p2, k2) thirteen times; k2tog, k1, (p2, k2) thirteen times; p2, k1, k2tog, (k2, p2) seven times. 4th Round: (k2, p2) six times; k2, k2tog, p2, (k2, p2) thirteen times; k2tog, k2; (p2, k2) twelve times; p2, k2, k2tog, (p2, k2) thirteen times; p2, k2tog; (k2, p2) seven times. 5th Round: (k2, p2) six times; k1, k2tog, p2; (k2, p2) thirteen times; k2tog, k1, p2; (k2, p2) 12 times, k1, k2tog, p2; (k2, p2) thirteen times; k2tog, k1, p2; (k2, p2) six times. Continue decreasing in this manner until the yoke measures 3 inches from the commencement. With right side facing and using No 8 needles, pick up and knit 67 sts around the head of the sleeve, (leave the cast off armhole sts). 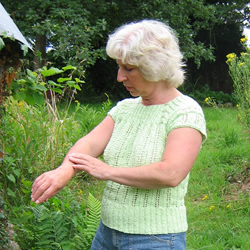 You will knit backwards and forwards in pattern across these sts, shaping the sleeve by knitting short rows. 1st Row: K2, * k2tog; k2; yarn forward; k1; yarn forward; k2; k2tog through back loops; repeat from * to the last 2 sts, k2. 2nd Row: P2tog, purl to the last 2 sts, p2tog. [65sts]. 3rd Row: K1 * k2tog; k2; yarn forward; k1; yarn forward; k2; k2tog through back loops; repeat from * 4 times more; wrap next stitch, by putting yarn forward, slipping the next st on the the right needle, putting the yarn back to the back of the work, and then slipping the slipped st back on to the left hand needle again; turn. [You turn with 19 sts left on the needle]. 4th Row: P27, wrap next stitch; turn. [You turn with 19 sts left on the needle]. 5th Row: K1, * k2tog; k2; yarn forward; k1; yarn forward; k2; k2tog through back loops; repeat from * once; wrap next stitch; turn, [You turn with 28 sts left on the needle]. 6th Row: P9, wrap next stitch; turn. 7th Row: K1, * k2tog; k2; yarn forward; k1; yarn forward; k2; k2tog through back loops; repeat from * across all sts to last st, k1. 9th Row: K1, * k2tog; k2; yarn forward; k1; yarn forward; k2; k2tog through back loops; repeat from * 5 times more; wrap next stitch; turn. [You turn with 10 sts left on the needle]. 10th Row: P45, wrap next stitch; turn. [You turn with 10 sts left on the needle]. 11th Row: K1, * k2tog; k2; yarn forward; k1; yarn forward; k2; k2tog through back loops; repeat from * across all sts to last st, k1. 13th Row: K1, * k2tog; k2; yarn forward; k1; yarn forward; k2; k2tog through back loops; repeat from * to the last st, k1. Knit the next 3 rows. Cast off (from wrong side) knitwise. Sew up sleeve seams under the arms, and sew in all ends. Sew four buttons up each of the two front corners of yoke. 5 x 50g balls Stylecraft Sirocco 80% cotton, 20% linen; 98yds/90m per ball. Numbers 8, 9, 10, and 11 (4, 3¾, 3¼ and 3mm) circular needles. 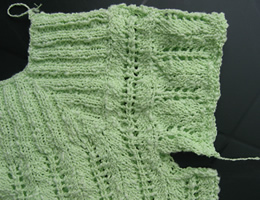 Yarn knits to 20st and 28 rows to four inches on No 8 needles. One pattern = 1½ in on No 8 needles. Original sized for bust 34 inches; length 18 inches. 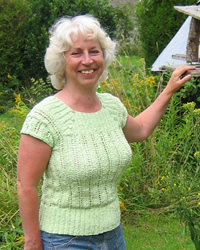 This version in a slightly thicker yarn fits 36-38 inch bust as shown in photo, and instructions are for a 20 inch length. I wanted to knit this in a bouclé or slub cotton and just could not find what I wanted - there is the fabulous Debbie Bliss Astrakhan, but that is too wintry and thick. Then, in a local haberdashers, I found this Stylecraft yarn which is absolutely what I was looking for and has the benefit of being natural fibre and very good value! Original: Paton's Super Brindle, which comes (came) in white flecked with colours. This was probably finer than Sirocco - more a straight DK at 22 sts per 4 inches I am guessing. These follow the foundation decreasing "Round 1". Instead of writing out every stitch, I have indicated the number of sts between the decreases; "rib" means k2 p2 rib, following the ribs as set out in the row below. 2nd Round: rib 26, p2tog, rib 58, p2tog, rib 54, p2tog, rib 58, p2tog, rib 28. 3rd Round: rib 26, k2tog, rib 56, k2tog, rib 54, k2tog, rib 56, k2tog, rib 28. 4th Round: rib 26, k2tog, rib 54, k2tog, rib 54, k2tog, rib 54, k2tog, rib 28. 5th Round: rib 25, k2tog, rib 54, k2tog, rib 52, k2tog, rib 54, k2tog, rib 27. 6th Round: rib 24, k2tog, rib 54, k2tog, rib 50, k2tog, rib 54, k2tog, rib 26. 7th Round: rib 24, p2tog, rib 52, p2tog, rib 50, p2tog, rib 52, p2tog, rib 26. 8th Round: rib 24, p2tog, rib 50, p2tog, rib 50, p2tog, rib 50, p2tog, rib 26. 9th Round: rib 23, p2tog, rib 50, p2tog, rib 48, p2tog, rib 50, p2tog, rib 25. 10th Round: rib 22, p2tog, rib 50, p2tog, rib 46, p2tog, rib 50, p2tog, rib 24. 11th Round: rib 22, k2tog, rib 48, k2tog, rib 46, k2tog, rib 48, k2tog, rib 24. 12th Round: rib 22, k2tog, rib 46, k2tog, rib 46, k2tog, rib 46, k2tog, rib 24. 13th Round: rib 21, k2tog, rib 46, k2tog, rib 44, k2tog, rib 46, k2tog, rib 23. 14th Round: rib 20, k2tog, rib 46, k2tog, rib 42, k2tog, rib 46, k2tog, rib 22. 15th Round: rib 20, p2tog, rib 44, p2tog, rib 42, p2tog, rib 44, p2tog, rib 22. 16th Round: rib 20, p2tog, rib 42, p2tog, rib 42, p2tog, rib 42, p2tog, rib 22. 17th Round: rib 19, p2tog, rib 42, p2tog, rib 40, p2tog, rib 42, p2tog, rib 21. 18th Round: rib 18, p2tog, rib 42, p2tog, rib 38, p2tog, rib 42, p2tog, rib 20. 19th Round: rib 18, k2tog, rib 40, k2tog, rib 38, k2tog, rib 40, k2tog, rib 20. 20th Round: rib 18, k2tog, rib 38, k2tog, rib 38, k2tog, rib 38, k2tog, rib 20. 21st Round: rib 17, k2tog, rib 38, k2tog, rib 36, k2tog, rib 38, k2tog, rib 19. 22nd Round: rib 16, k2tog, rib 38, k2tog, rib 34, k2tog, rib 38, k2tog, rib 18. 23rd Round: rib 16, p2tog, rib 36, p2tog, rib 34, p2tog, rib 36, p2tog, rib 18. 24th Round: rib 16, p2tog, rib 34, p2tog, rib 34, p2tog, rib 34, p2tog, rib 18. 25th Round: [Cast off in pattern as you go]; rib 15, p2tog, rib 34, p2tog, rib 32, p2tog, rib 34, p2tog, rib 17.